Now that the origin story of Superman has been laid out for STAS, it’s time to get into the everyday heroics of Superman. Writers Marty Isenberg and Robert Skir kick off the series in earnest not with a classic Superman foe, but instead by focusing on recreating one of the more obscure Superman villains, Toyman. 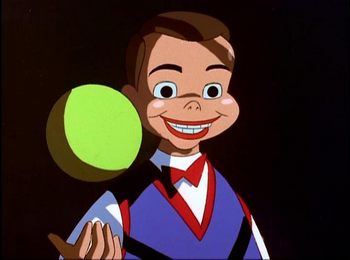 Isenberg and Skir continue the great DCAU tradition of taking a goofy villain from days gone by and turning them into a formidable enemy by giving Toyman a nightmarish, forever smiling, ceramic mask and an array of deadly weapons disguised as toys. A lot of the “toys” the Toyman uses seem reminiscent of something from a Burton-era Batman film, namely the giant duck equipped with machine guns and the overly-cartoonish time bombs. The use of such friendly looking kid’s toys juxtaposed with Toyman’s murderous quest for revenge lead to some darkly comic moments. Scenes of Superman uppercutting a giant mechanical duck and crushing a superfast rubber ball with the clap of his hands seems straight out of the Silver Age, but here it never gets too goofy or too low stakes. Our first look at Toyman highlights the terrifying disguise as he steps out of the shadows to confront the henchmen of Metropolis mobster Bruno Mannheim. His childlike stature, coupled with the soulless eyes of the mask, make for some unnerving imagery. After several attempts on Mannheim’s life, it’s revealed that he was responsible for the incarceration of Toyman’s father, kindly old toymaker Winslow Schott. Mannheim let him take all the blame for a numbers racket run out of his shop, leading him to die in prison while his son, the Toyman, was shipped to foster homes. Toyman finally captures Mannheim, taking him to his hideout for execution by toy soldier. Toyman decides to also kidnap Lois Lane after she badmouthed him in an article on the Mannheim assassination attempts. Dressing her up in a doll’s outfit and stowing her away in his giant dollhouse, Toyman decides to explain his history to her through an elaborate storybook. There is an odd fetishism to the way Toyman dressed up Lois, as if the childlike mind and older body are clashing trying to make her into the closest female approximation of how he seems himself, stuck permanently playing with the toys of a nonexistent childhood. Superman arrives to save Mannheim and Lois, but Toyman attacks him with what appears to be sentient Gakk. It’s always fun to see Superman get creative with his powers, and here he turns himself into a human tornado to get the stuff off him. Toyman blows up the factory as Superman rescues Mannheim and Lois, but of course the only thing the police can find of him are the cracked remnants of the mask. The next episode debuts the deadliest Superman foe of all, the element of kryptonite. Dini, Timm, and Burnett made it a point to depower Superman in this series to make him a more interesting character, and the inclusion of kryptonite gives them an easy out for whenever the plot calls for a more weakened Superman. At least for this episode, kryptonite isn’t used as a crutch as often as it is when lesser comic book writers suddenly need to have Superman lose a fight. When trying to stop criminals stealing from the new Luthor Museum of Natural History, Superman falls ill after getting near some luminescent rocks on display. Lex notices his weakness on the security footage, and decides to investigate the rock further. These rocks are, of course, kryptonite, the fragmented remnants of Superman’s homeworld. To further test the effect the rocks have on Superman, he hires some thugs to lead him into a trap where his powers will be affected by the kryptonite. The chase scene between Supes and the jetpack toting thieves is accompanied by an excellent jazz score that gives the scene a lighthearted and energetic feel and reminds me of something more akin to The Seatbelts than the typical DCAU soundtrack. Lisa Edelstein makes her first appearance in this episode as Mercy Graves, Luthor’s valet/bodyguard/confidant. Graves is this series’ version of Harley Quinn, the female sidekick for the hero’s main villain that has a personality to match. Graves never gained the same amount of popularity as Quinn did, which is a shame since I find her to be almost as interesting of a character. Her readiness to go as far as to kill for Luthor, yet still have a domineering presence, is interesting, although their relationship is based far more on payment than fanaticism. This episode also marks the first appearance of Professor Emil Hamilton, an ally of Superman who will act as his “Q” throughout most of the series, popping up every so often to offer up a new development or suit for Superman to wear to defeat his enemies. After being lured to the museum on the promise of more info about the kryptonite, Lois and Superman are trapped with a remote controlled dinosaur and a ton of kryptonite. Just like last episode the imagery of the fight scene is straight out of the goofier side of the Silver Age, this time with the added danger of kryptonite. Lois is able to show off her basketball skills gained from wasting time in the office by launching the green rock into the lead cups on display so Superman can beat up the robot T-Rex. This isn’t the last time we’ll be seeing kryptonite and its effectiveness as a plot device varies from episode to episode, but this episode does a nice enough job of laying out the parameters of Superman’s biggest weakness and how he is able to overcome it. -I can’t be the only one who was confused as a kid by what exactly Toyman was. When I was young I couldn’t really tell if he was a robot sent to do the real Toyman’s bidding, a man in a mask, a kid in a mask, or some other weird explanation. Chalk it up to the short attention spans of the young and sugar-ridden.